The last few times we drove past Raphael Winery thinking about going in for a tasting, we noted they were “Closed for a Private Event.” It’s no surprise that that happens there fairly frequently, since they have a beautiful facility with plenty of room for large parties. But instead of us going there, Raphael came to us! We walked into our favorite Nassau County wine store to find a manager from Raphael busily setting up a free tasting. The tiny sips and short time were not conducive to an in-depth review, so here are just a few quick notes. At some point this winter we hope to get there when the room is not being used for a wedding or other event to do a more in-depth assessment. We tried the cabernet franc, the merlot, the sauvignon blanc, and the Portico, an unusual white port. We like all three wines, but we especially enjoyed the 2013 Portico, made from a combination of grappa and sauvignon blanc grapes. It is sweet without being at all cloying, and I could see it as going well with paté or dark chocolate—a little taste of which the manager was able to provide. Mmm…yes, it did go well. We bought a bottle, planning to offer it as an after dinner drink on Thanksgiving. Happy Thanksgiving everyone! The La Fontana fountain at Raphael the last time we were there. P.S. The manager also gave us a schedule of their free concert series, scheduled for Sundays through January. Check their website to confirm: www.raphaelwine.com. The farm stands are starting to close now, though the ones that are open are still overflowing with pumpkins, kale, eggplant, the last of the tomatoes, and more. I have to restrain myself from buying everything. Now that the October crowds have left—and Columbus Day Weekend is the worst time to come to the North Fork, unfortunately, what with the corn maze goers, the pumpkin and apple pickers, and the harvest wine tasters—I thought this would be a good time to discuss a few possible itineraries. From time to time friends ask me where to go for wine tastings, so here are some summary recommendations for various situations and tastes. I’m going assume you’re heading from west to east for all of these. 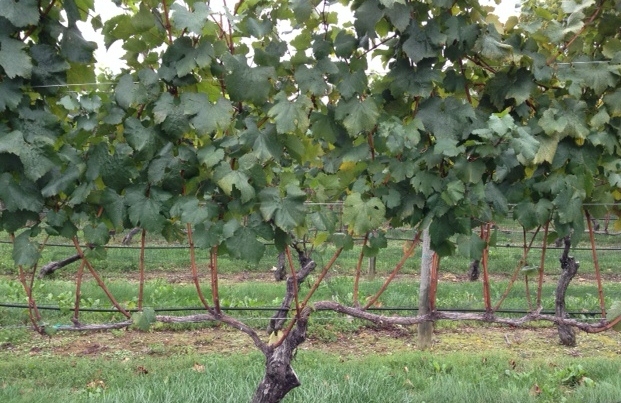 Each itinerary includes three wineries. I don’t recommend more than that, especially for the driver, who may want to just take a sip of most and dump the rest. All the wineries are fine about people sharing a tasting, another good way to go. However, if you space them out and go slowly, eating snacks here and there, you should be fine. You can get more details on any of these wineries by using the search function on my blog. You want to sit outside and relax with a couple of tastings, and then maybe go somewhere for dinner. Also, you don’t want to cope with the crowds you are likely to find on a warm summer weekend. 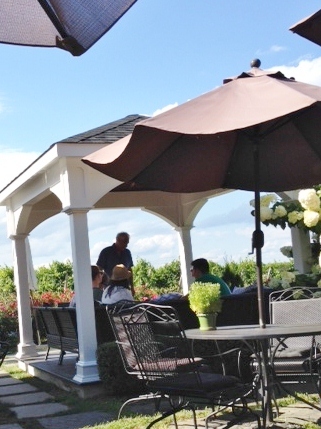 A nice place to start is Jamesport Vineyards, especially if it is your first stop and it is around lunch time. Out in the back yard there is a pizza oven and an oyster bar, both well worth trying if you have not brought your own picnic. Though they may attract lots of people, their outdoor area is quite large, so you won’t feel crowded. Sometimes they have music, too. The wines I recommend are: the Cinq Blanc, the Reserve Sauvignon Blanc, the Mattituck Cabernet Franc, the Mélange de Trois, the MTK Syrah, and the Jubilant Reserve. If you’re getting oysters, get the Sauvignon Blanc. Quite a bit further out on the Main Road is Croteaux Vineyards, one of our favorite places for outdoor wining. The shady garden has comfortable Adirondack chairs as well as pretty tables for groups and many nooks. they don’t allow limos or large groups. I would get a full tasting of all six wines, since they provide an interesting education into the various tastes of rosé—which is all they make here. Rosé is a perfect summer wine, and Croteaux’s are our favorites. They also have a limited menu of snacks, and the goat cheese is excellent. Our favorite of their wines is the 314 Clone, though we like them all. One Woman Wines & Vineyard is just off Sound Avenue, a bit north and east of Croteaux. 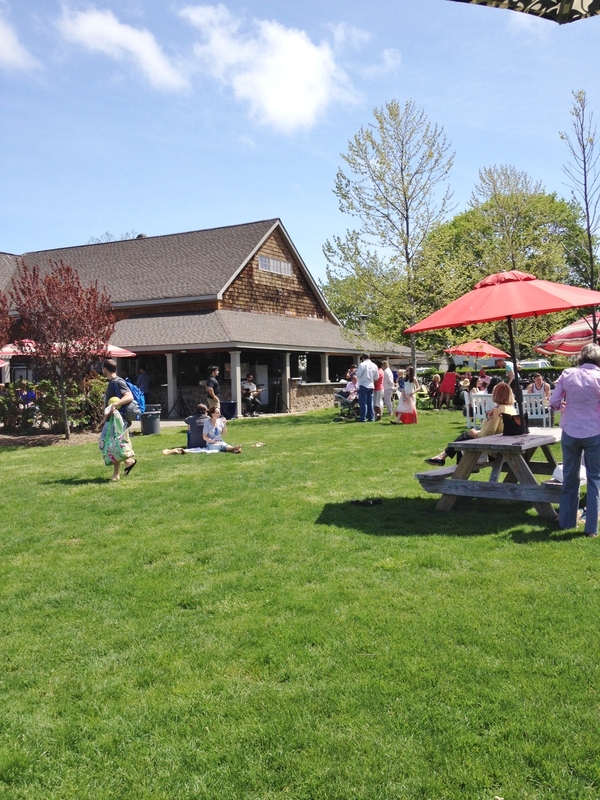 The tasting room is tiny, so it is best to go there when you can sit outside at one of the picnic tables on the little deck or stand at the outside bar. Her whites (yes, there really is a one woman) are best, especially the Grüner Veltliner and the Gewürztraminer. 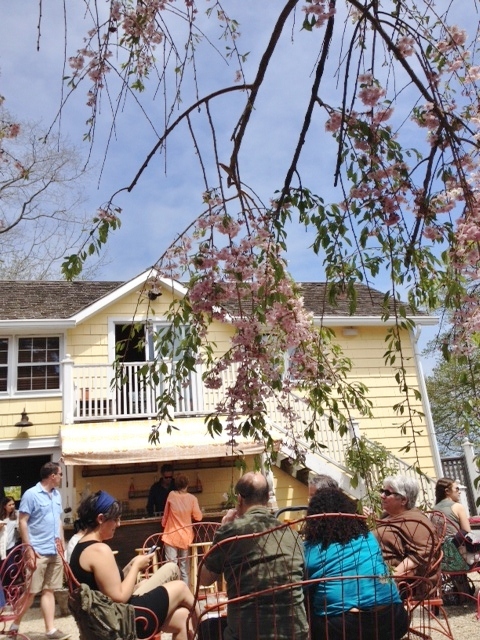 After you leave Jamesport, you may want to stop on Love Lane in Mattituck, where you can check out the little shops and maybe stop into the Village Cheese Shop or Lombardi’s Italian Grocery to buy picnic foods or have a snack. Or you can return there for dinner. Love Lane Kitchen is a very popular lunch, brunch, and dinner spot, and the food is quite good. I also recommend A Mano, across the Main Road from Love Lane, for a more upscale lunch or dinner. Within the strip mall, Michelangelo is a reliable red sauce Italian place, with a casual pizza parlor out front and a slightly more formal dining room in the back. Oh, and don’t ignore Magic Fountain, the ice cream store with an ever-changing roster of home-made flavors. The roads are mobbed, and so are all the wineries you drive past. It’s not quite warm enough to sit outside, however, so the above choices don’t appeal to you. Time to go off the beaten path. Squint and you can pretend you’re sitting in a piazza in Italy instead of Diliberto’s. On Manor Lane you’ll find Diliberto Winery, just down the street from Woodside Farms apple orchard (which is probably a madhouse if the sun is shining). 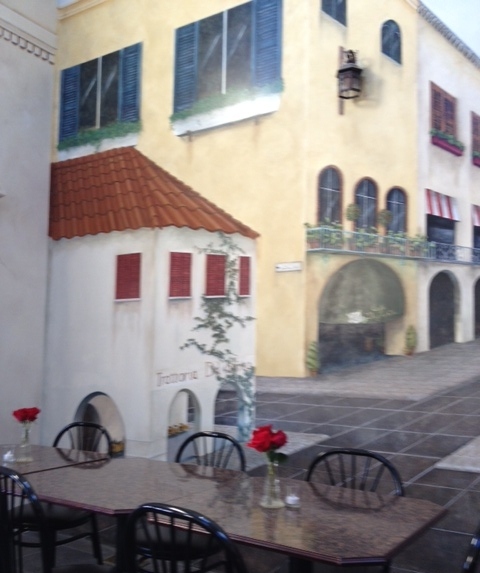 Diliberto’s tasting room is quite cozy, painted with scenes of an Italian village in trompe l’oeil fashion, and you are likely to encounter Sal Diliberto himself. If you’re lucky, he’ll make one of his thin crust pizzas for you. (He used to serve them for free, but now he does charge for them.) The wines we like the best are the 03 Sauvignon Blanc and the 2013 Tre. Get the Tre if you’re having pizza. 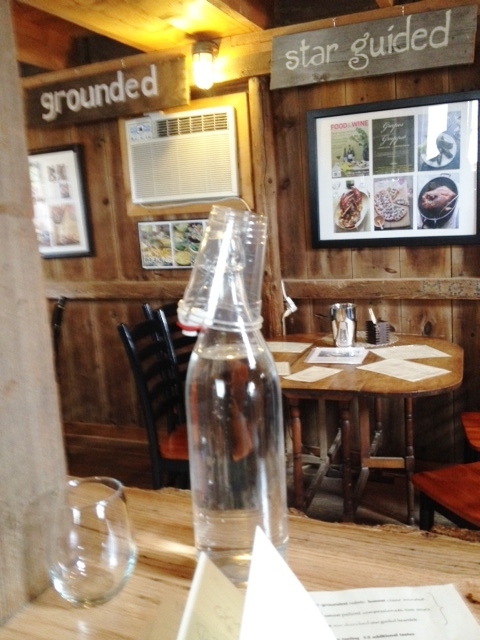 Water for cleansing your palate–or your glass–at Shinn. Now you’re going to head north on Mill Lane to Oregon Road, where you’ll find Shinn Estates Vineyards. 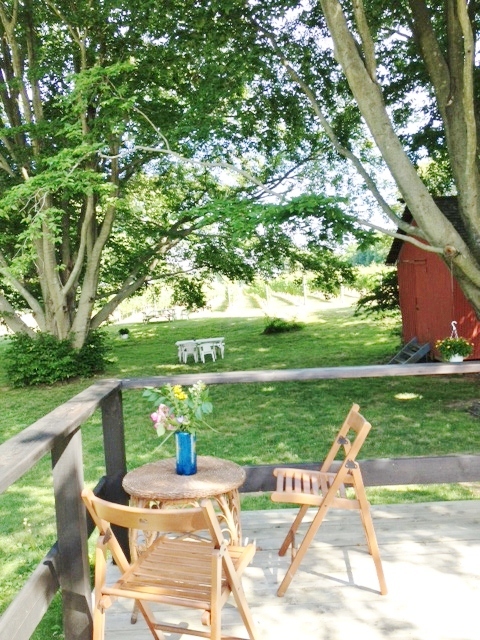 Surrounded by farm fields, Shinn definitely has a laid-back vibe. You may even get to pet the resident pooch. 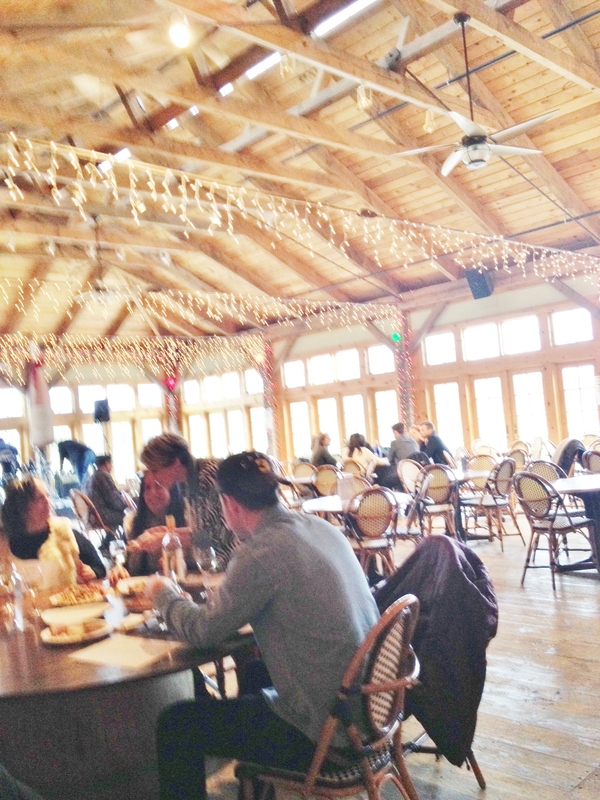 The tasting room is rustic and intimate, so let’s hope it’s not crowded. Our favorite wines are the First Fruit, the Pinot Blanc, and the Wild Boar Doe, and they also make sherry and eau de vie. They sell their own snacks. Also on Oregon Road is Lieb Cellars. They have another tasting room on Sound Avenue where they feature their lower-priced wines. This room is rather elegant, and the last time we were there we had it to ourselves, but others may have found it by now. However, they do not allow limos or groups, so it will probably be fine. They have cheese boards available. We did our last Lieb tasting at their Sound Avenue location, so I’m not sure what’s on the menu now, but we like many of their wines, especially the Reserve Cabernet Franc or, for an inexpensive everyday red, the Red Blend or white, the White Blend. When you are done you will be close to Southold, where you have a number of meal options. If you felt the need for brunch or lunch in between the above choices, you could have stopped at Erik’s, on Sound Avenue, where you order at the counter and they bring you your food. Very popular, so it may be crowded. One of our favorite casual spots is Founder’s Tavern, where we love the home-made potato chips, the Buffalo wings, and the house burger. If you’re looking for a fancy dinner, you can choose between North Fork Table and Inn or a newcomer we liked very much, Caci. A bit further down the Main Road is the Port of Egypt marina, which houses two restaurants: A Lure, which features excellent seafood, and Pepi’s, which is fairly classic Italian. Both give you a view of the water. Now let’s imagine that you have kids with you, which we see quite frequently. Some places actually ban children, like Diliberto’s, while others accommodate them. Of course, you’ll probably have to split up, depending on the ages of the children, to supervise them, but at least at these places there will be something for them to do, or at least room for them to run around. This is the room where you find live entertainment and food for sale at Martha Clara. Martha Clara has something for everyone. Some good wines for those who are serious, a big room with tables and chairs and an extensive food menu for those who are hungry, and animals in pens outside to entertain the children. You can buy pellets with which to feed the animals, and children never seem to get tired of doing so. They also often have live music in the big room. The wines I like the best are the 2010 Northville Red, the 2010 Syrah, and the 2012 Estate Reserve Chardonnay. They can get very crowded on busy weekends, so be forewarned. Agritainment, thy name is Harbes. From what started as a simple farm stand, Harbes has grown into an industry, causing traffic jams on Sound Avenue in October as crowds head for their corn mazes and pumpkin picking. 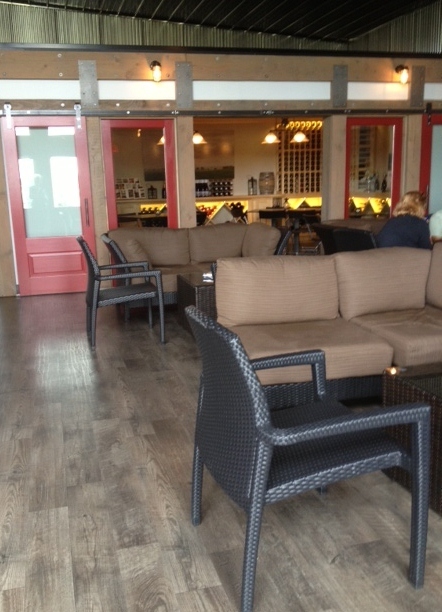 They also now have a tasting barn where you can sample their wines, and I was pleasantly surprised that I liked them. There is plenty of room for kids to run around, but I do not recommend you spring for the entry fee to the “Barnyard Adventure,” which is neither very much of a barnyard nor much of an adventure. However, there are a couple of farm machines kids can climb on without going into the “Adventure.” Across the street, at Pam’s, you can all go berry picking in season. We were last there two years ago, so the wines may have changed, but we liked the merlots and the oaked chardonnay. And while you’re there, I also recommend you buy some of their sweet corn to take home and cook. It’s the best on the North Fork. Old Field really does feel like an old farm. 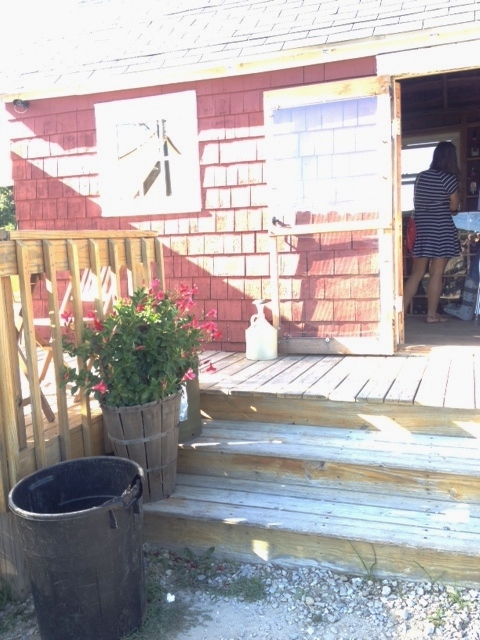 Almost all the way to Greenport you come to Old Field Vineyards, a rustic farm setting for the winery. Though they don’t cater to children the way Martha Clara does, they have ample outdoor space with ducks and chicks roaming around, or you can hike along the vines. Though they do have a small indoor space, this is another spot where the outdoor area is the most comfortable. We liked the 2012 Barrel Fermented Chardonnay, the Cacklin’ Rosé, and the ’07 Commodore Perry. One of my favorite things to do when we go wine tasting is chat with the owner of a winery. You can learn so much about wine and about how the specific wines you’re tasting were made that it makes the whole experience of wine tasting that much richer. Diliberto’s is one of those places, so do keep that in mind as well, but here are three others where you’re probably guaranteed to chat with the owner, his or her spouse, or a very dedicated member of the wine-making team. We’ve had lots of fun chatting with Adam Suprenant, the owner of Coffee Pot Cellars, who actually figured out who I was and that I write this blog. He and his wife Laura Klahre, who is a beekeeper and has plenty of interest to tell you about bees and honey, have always been behind the bar, sharing their enthusiasm for their products. We like all of his wines, but especially the Sauvignon Blanc, the 2013 Chardonnay, the Beasley’s Blend and the Meritage. Just a little further down the road, and look carefully or you may miss the turn-off, is Mattebella Vineyards where you have a good chance of talking with the owners—or even their children, for whom the winery is named. They have a lovely outdoor seating area, and serve a few little tastes of food to go with particular wines. Mr. and Mrs. Tobin, the owners, are generally there, and love to engage customers in conversation about their wines, though they now have a few helpers, so you may not get to talk to them if it is busy. We really liked the 2010 chardonnay, the 2012 Reserve Chardonnay, the 2014 Sparkling Rosé for a fun party drink, the Famiglia Red, and the 2010 Old World Blend. Regan Meader explaining his wines. 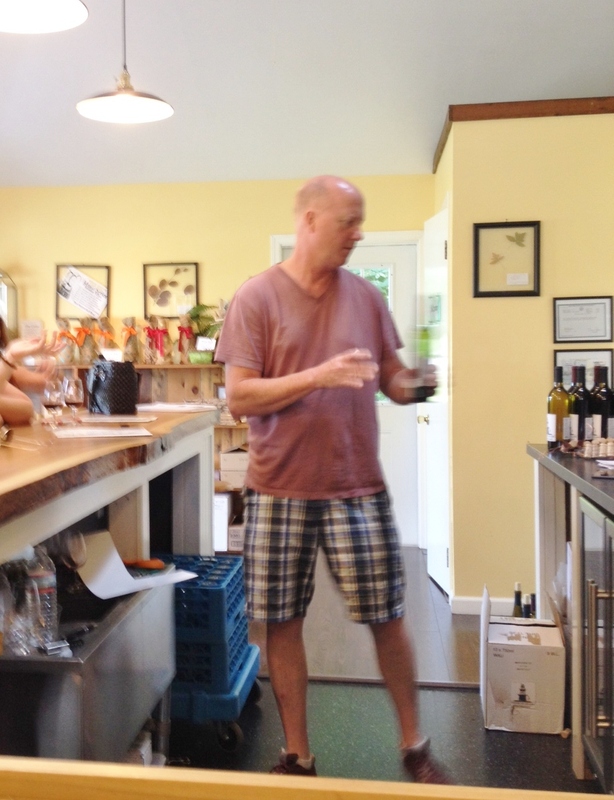 You’ll need your GPS to find Southold Farm + Cellar off on a back street, and, due to some permitting issues with the town of Southold you should check to be sure they are open, but once you get there you’ll find it is well worth the trouble. 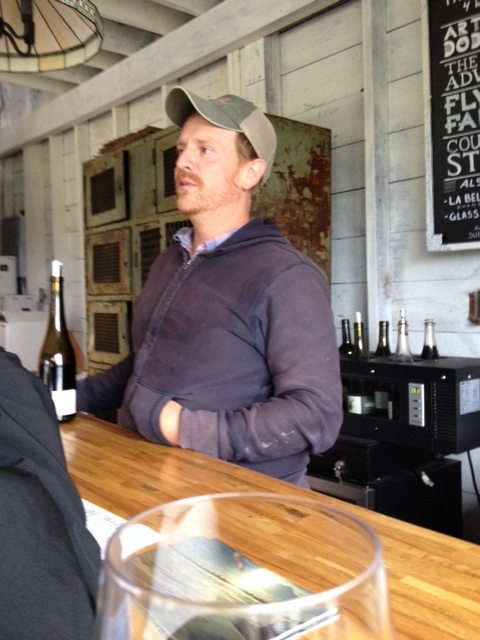 Regan Meader is the owner and winemaker, and he is also a charming and engaging purveyor of his own wines. We enjoyed chatting with him, particularly about how he came up with the poetic and original names for his wines. 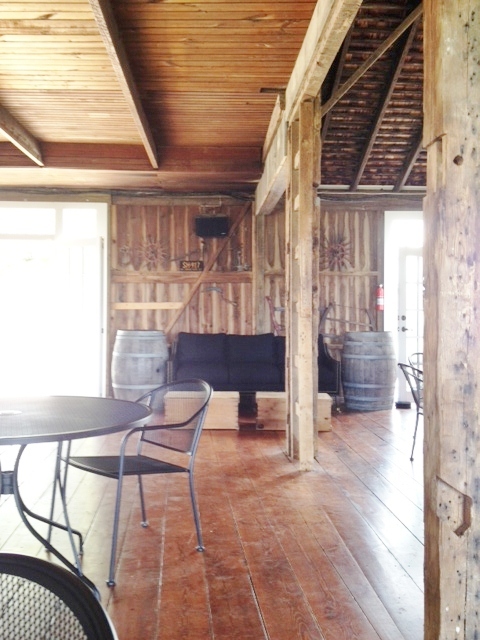 The tasting room is rustic but comfortable. I suggest you try all his wines, from Tilting at Windmills to Flying and Falling. 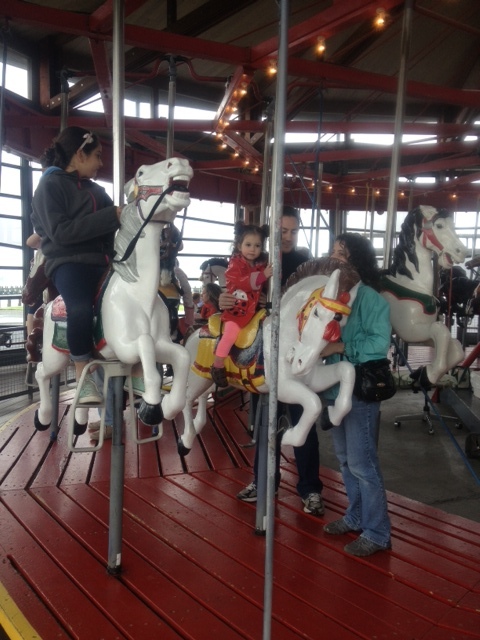 Well, here you are, near Greenport again, but this time sans children. To continue our artisan-ish theme, you might want to go to 1943 Pizza, where you can watch up close and personal as they shove your thin-crust pizza into the oven. I don’t know if you’ll find him hanging around, but Noah’s has good small plates from which to make a delicious meal. If you just want coffee and a snack, you should stop in to Aldo’s, where Aldo roasts his own coffee and may be your barista. He outlasted a Starbuck’s that opened across the street. Ha. Two other excellent, though pricier, options in town are Scrimshaw, on the dock (ask to sit outside if the weather is right), and The Frisky Oyster. We haven’t tried American Beech yet, but it looks good. That’s it for now, but I have other scenarios in mind!